I planned on, well more I wanted to, compose a scene on a Sunday for Titanic to celebrate its 3D opening in American theatres. But, I didn’t bother a) because I couldn’t find either of my two DVDs (don’t ask) and b) I’d already covered Kate’s loveliness in a previous entry, and there’s so much of her filmography I haven’t assessed here. So, I opted for Eternal Sunshine of the Spotless Mind. There are so many excellent scenes from Eternal Sunshine which are ripe for scene analysis and initially I opted to go for the most obvious (the train scene at the film’s opening) but instead I opted for a shorter, more tender scene. Eternal Sunshine of the Spotless Mind is the one of the last truly great romantic comedies and I kept diverting between a romantic scene and a comedic scene. I opted for the former. The Set-Up: Joel is the midst of having his memory erasing procedure from the folks at Lacuna and as this occurs the mind of the comatose Joel of the present redirects to moments in their relationship – not necessarily obviously visceral, but significant in the denigration of their relationship. This one is a key one, in only a few minutes giving us a perfect view of these people. Isn’t that just a gorgeous image? As far as hair colour goes, Kate as a redhead has always been a favourite – yes because of the Titanic memories it evokes (same goes for Nicole and Cate, both of them luminous as redheads). Joel and Clementine are so thoroughly dysfunctional a moment of solace is rare, and this only seems picturesque and tender because no one is speaking yet. (Keep an eye on the cup.) I still don’t think I’d submit this as Kate or Jim’s best, but they’re both superlative performances among the best of their careers and 2004. I’m drawn to Kate’s eyes in this scene; they’re so sad and doleful. And, yes, Clementine is something of a drama queen but she’s prone to moments of tenderness. Conversely, not-quite-asleep-Joel is at his least perceptive here not realising that this is a key moment. If this film were in chronological order, for example, this scene might not have been remembered by Joel because at the time it occurs he’s not able to discern that it’s something important. But as his memory is erased and he journeys through his past he realises the signposts. For example this, slightest of, smiles from him above. He thinks Clementine is play-acting, so he’s responding in turn. This quote is such an interesting bit, because it’s a perceptive quote and makes much sense but Joel is being so pretentious he doesn’t realise how much it doesn’t work for the situation he is in. Yes, Clementine is a virtual chatterbox, but her chatter isn’t airless, and she’s such an open book she’s constantly communicating. The quote, also, zeroes in on Joel’s own issues. As in introvert he carries around sentences like this as armour. He’s not silent because he’s nervous, or scared – or so he would have us believe – he’s silent because “talking isn’t necessarily communicating” which is ultimate apropos of nothing. Kate and those eyes again, I love the quick look Joel steals at her – and things are about to get so frenetic when comatose Joel he intersects with past Joel and because of the subjectivity in his memory you begin to wonder if that might be affecting the perspective we’re being shown. Take for example how within a single shot Clementine moves from doleful and composed to aggressively annoyed, and it works both ways because Clementine IS the sort of person who would change her temperament as swiftly. Joel’s facial expressions are responsible for making this portion in particularly tinge with humour as well as sadness borne from the certainty that this will end poorly. And the camera begins to get frenetic. The lighting becomes skewed, the two actors are shot from off centre. And, considering that the real Joel is currently getting his memory erased that is a major understatement. Things are being played out of loop. 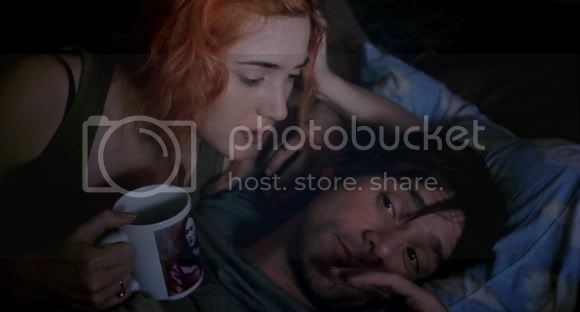 Clementine is speaking but it’s not in sync with the images and remember, I told you to focus on the teacup? Notice that Clementine’s image is no longer there? Erasure is at work. I love how that word, the final one in the scene, just hangs there. The fact that the movie manages to be so funny and romantic while being so devastating is as much a credit to the actors as it is the awesomeness of Gondry’s work here and Kaufman and Gondry’s script. And, having said her bit, Clementine turns away, and she is none too pleased. 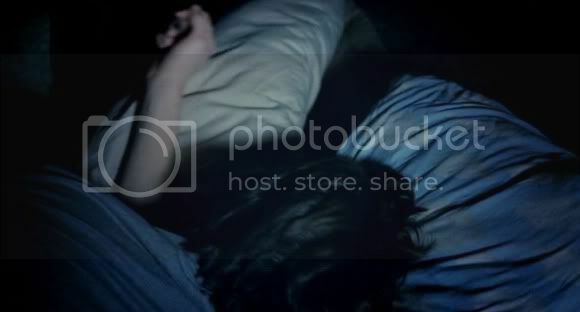 And, this final shot – has she left the bed….or has she been erased? It’s so ambiguous, and it’s so beautiful. Eternal Sunshine of the Spotless Mind is best when it’s _____________. Kate is so wonderful because _____________. This scene is a perfect encapsulation of the film’s ______________. Sound off below. 1.) Honest. 2.) Abrasive. 3.) Intricacy. Ah, such a great breakdown of a scene. It really shows how much you can get from film making. I agree with the above comment that this film is at it's best when it shows those honest moments. It works so well because it's so relatable. I think it's a film with a really beautiful and truthful message. A great scene from a great film... when I saw the film for the first time recently, I felt I only caught a glimpse of all the greatness that is hidden in the scenes... for example I never noticed that Kate's image disappeared from the tea cup and everything. lindsay so true. this scene is short and it fits where it goes so well, you sort of don't stop to think how much it's telling you, that's the power of film generally but the power of a GREAT film in particular. mette because of the way this film uses the flashback techniques it's GREAT for re-watching, missing the beats the first time and finding them on second, third watches is what makes it such an enduring one, i think.